With the end of the season in sight me and James decided to treat ourselves to a day off work and a trip to the Test Valley. The grayling challenges had been met, time for a relaxing day's fishing - no targets except to enjoy ourselves. And this time we were joined by James Senior. While Senior and Junior targeted grayling I targeted pike but due to the rain over the past few days I couldn't see the fish well enough to stalk them in the slightly murky water, and as I soon found out fishing blind meant the trout would get there first. 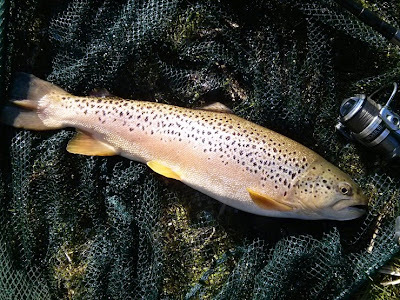 I landed 4 trout to about 4lb on sprats, and many more sprats were nicked or shredded - about midmorning I gave up. 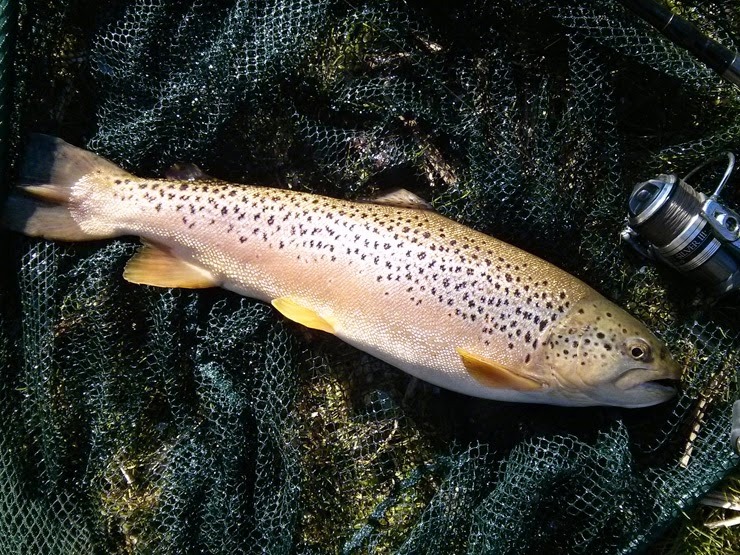 And a 1lb 15½oz fish above, really wish this one had had a bigger breakfast! 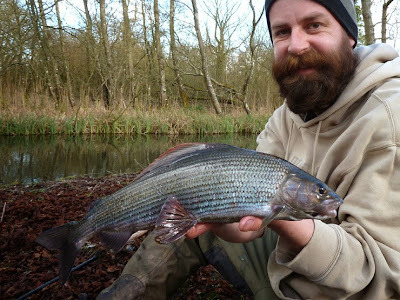 By the afternoon both James' had beat their grayling PBs, blog details here, and despite the lack of pike it was a great day all round. Then, out-of-the-blue I caught a 14oz roach - might not sound like much but it was my biggest roach for a long time, I'd found a challenge - I wanted a pounder! I stuck it out in the swim, reasoning where there is one there will be more. And almost had my chance loosing one that looked a stocky pound. As the sun set and I was down to my last cast I got one! 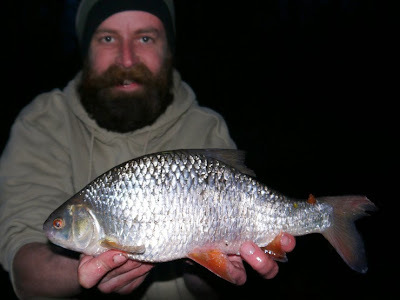 Hours of trotting under the same tree and I beat my 18 year old PB, a 1lb 12oz beautiful roach was in the net - brilliant! A new PB each, what a trip, and what a roach. Again thanks to Chris and the guys - tonight I dream of Roach!! The roach photo looks like it was taken in the pitch black, it was still light enough to see the float - just a setting on James' camera that didn't bleach the roach out. What a great variety of fish. Looks like a lot of fun. It was great fun, a real challenge but rewarding. It's so easy to spook them and if you do they don't move they just don't feed - then it's a lot of walking about searching for another shoal. Would have been nice to add a pike to the mix but I'm not complaining! It's a slippery slope once you get the grayling bug - I spend most of the winter looking forward to them - can't resist the beauty of them which you are capturing in the pics, but I find them a devil to stay still for the camera! Agreed! And they're really fragile so faffing with em wriggling around is not good for them. 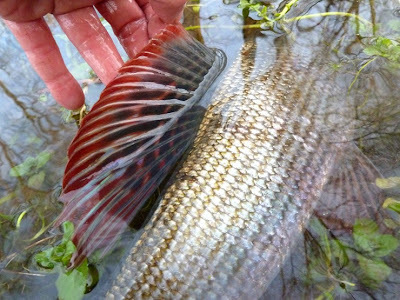 Great roach and pic Brian. 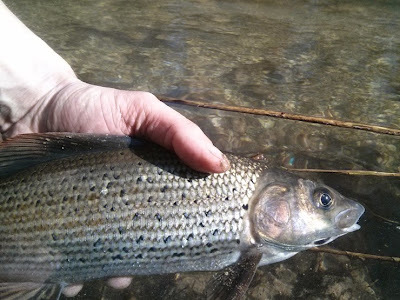 Anon - I know, I have the crusian bug and now the grayling bug... 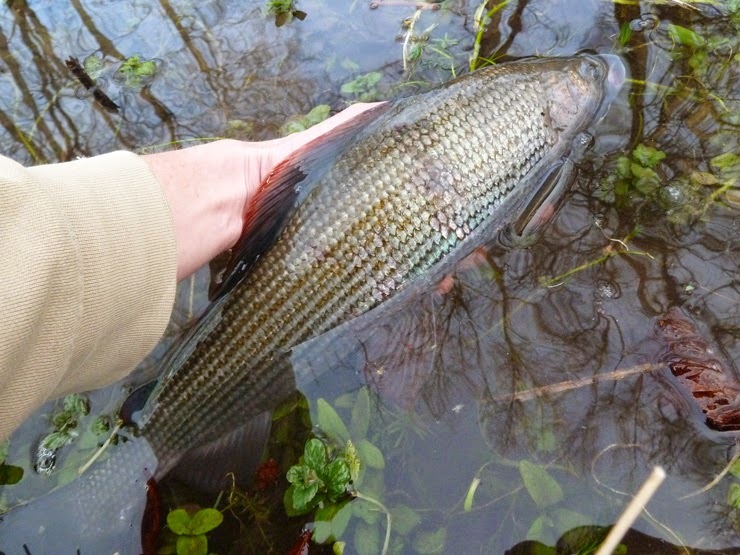 It's turning me into an all-round angler! They do hate the trophy shot, that's why I gave up and held them in the water for the photos (the one James photographed for me was good as gold - look, one handed). Russell - Yeah, we held them low and still had a few mid-air shots, if it's not a PB better to leave them in the water for the photos, they instantly relax. Well pleased with the roach, and glad James was there with his 'roach at dusk' setting on his camera, tried a photo on mine and it was just a silver blur!